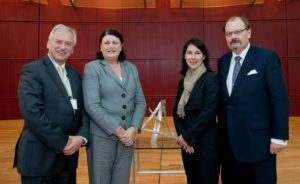 The 2010 EARTO Innovation Prize was awarded at a special ceremony at the Permanent Representation of the Free State of Bavaria in central Brussels on the afternoon of 27 October, starting at 17:00, followed by an evening reception. The 2010 EARTO Innovation Prize was awarded to the Fraunhofer Gesellschaft for the development of a highly innovative concentrator module for solar panels. The winning innovative technology has already transformed the future of solar power by doubling the efficiency of solar panels compared to conventional silicon-based cells. It is a good example of how RTOs can exploit and adapt research effectively for the benefit of society and the economy. Commissioner for Research, Innovation and Science Geoghegan-Quinn presented the 2010 EARTO Innovation Prize to the winning team, after sharing her thoughts on future direction of European research and innovation policies with the audience. The award ceremony for the prize also featured keynote speeches by Secretary of State of the Bavarian Ministry for Economic Affairs, Infrastructure, Transport and Technology, Katja Hessel, and a representative of Belgian Capital-Region Minister BenoÃ®t Cerexhe, who currently chairs the meetings of the Research Ministers in the European Council of Ministers. Key highlights this year were the publication of a study on the role and impact of RTOs in Europe prepared by the Technopolis Group at the request of EARTO and the publication of a set of case studies of high-impact innovations produced with a significant contribution by EARTO members.